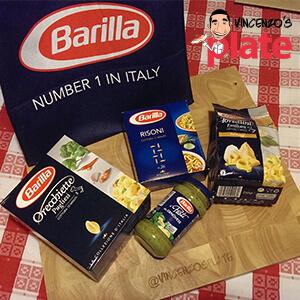 Home » It’s the name on the box…Thank you Barilla! It’s the name on the box…Thank you Barilla! 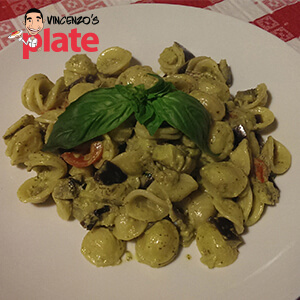 Welcome to the latest Vincenzo’s Plate blog post! I was lucky enough to recently receive a delicious goodie bag from Barilla Australia and I want to share with you my excitement! The bag had lots of great Italian ingredients inside, including my favourite jar of Pesto Genovese, different types of dry pasta, a nice Barilla apron and…my most favourite biscuits in the WHOLE WORLD: “Mulino Bianco – Pan di Stelle“!!! I have been eating these biscuits since I was a child growing up in Italy, and every time I go back, my mum stocks the cupboard with kilos and kilos of them for me to enjoy! In English, “Pan di stelle”, means “Bread of stars”! I was so confused of what to cook first and it was starting to make me hungry, so I opened the packet of biscuits and I ate them ALL!!! My stomach was so happy and helped me to decide what to cook. I ended up using the Barilla Orechiette Pugliesi and cooked them with the Barilla Genovese pesto, adding some fresh eggplant and juicy cherry tomatoes for the sauce. While it was still yummy and hot, I sprinkled freshly grated parmesan cheese all over the top and waited until it started to melt before I gobbled a big serve. Write a comment below if you would like me to recreate this dish for one of my video recipes on You Tube! I would really like to thank Barilla Australia from the bottom of my heart for giving me these delicious goodies to share with you all. What is your favourite Barilla product? Write a comment below and let me know! Thanks for reading and see you in the next Vincenzo’s Plate video recipe and blog post, coming soon. 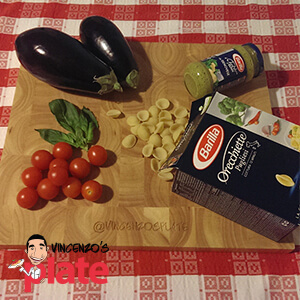 E ora si mangia, Vincenzo’s Plate! PS: I got into trouble from my wife for eating all the Pan di Stelle biscuits in one go…OOPS!